Is it just sitting on a stool that makes it High Tea? At Fil’s, you can eat your fill without inflating the bill! It’s not quite the Ritz, but complaints would be minor! And prices were fair for this part of the ‘hood. So, in a score out of ten, it’s almost a niner! Where we went: It was our good friend Garey’s nth birthday last week and since we were unable to get together on the actual evening, we decided to go to breakfast together on Saturday morning instead. 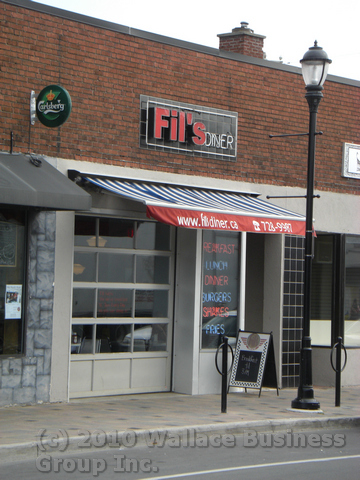 Garey picked Fil’s diner on Wellington in the Parkdale Market area in Hintonburg as his venue of choice. We do the breakfast thing with Garey three or four times a year and usually select John’s Quick Lunch just down the street. This is a very vibrant and interesting part of Ottawa and strolling the sidewalks window-shopping or people-watching is a great way to either work up an appetite or walk off a heavy meal. 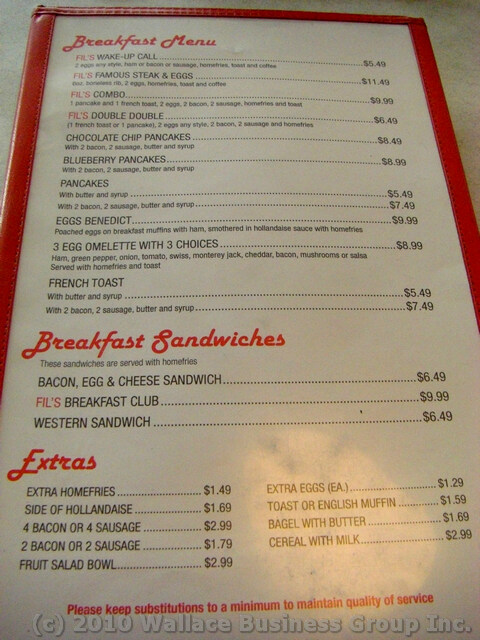 What we ordered: Well, we went for breakfast and Fil’s, like most other eating establishments of its ilk, offers a special which it unoriginally names a wake-up call for $5.49 including bottomless coffee. Dorothy, Ian and Garey all ordered this. Personally, I decided to get really innovative and boldly ordered the blueberry pancakes. I say boldly because, more often than not, these are a disappointment, since it is something that I personally prepare myself at home and therefore have unrealistically high expectations. As we waited for our order, coffee was filled by whichever server happened to pass by. This is a better system than those restaurants which only allow a table’s actual server to refill. Both servers were cheerful and friendly despite being somewhat rushed. 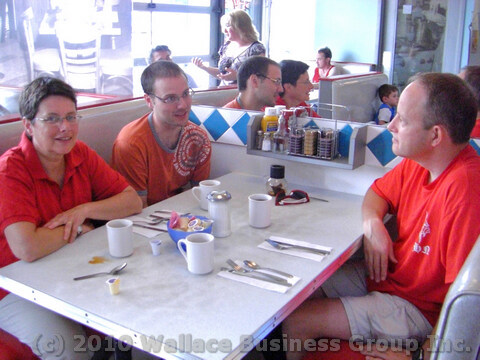 What we got: Generally speaking, one would tend to think that it is hard to mess up breakfast and indeed, the Orange trio all seemed happy enough with their choices. Home fries can tend to be a good yardstick in comparing breakfasts between restaurants. Fil’s got a passing grade in this area. Although nothing was acclaimed as outstanding, neither was anyone displeased with their choice. Unfortunately, I cannot say the same for the pancakes. As they came to the table, I had high hopes! Presentation was good; two large, apparently fluffy, golden brown pancakes filled with real blueberries looked up at me from the plate. Oftentimes, blueberry pancakes are simply regular ones smothered with blueberry pie filling. However, the proof of the pancakes was not in the eating. Although brown on the outside, the batter appeared to be still raw in the centre and yet was somehow of a dry consistency. The blueberries were small and hard. I did not even completely finish the meal because I noted that I was eating for the sake of eating, not because I was enjoying the experience. Worthy of note: One of Garey’s foibles is that he likes his toast to be burnt. Not just well done but actually reduced to charcoal on the outside. Although it may be a little odd, it is a good test of a restaurant’s attention to detail. Fil’s delivered in this department and his toast was indeed black. Also, the pancakes were served with real butter and the syrup, although, not surprisingly not real maple syrup, was at least not served from plastic packages.